The closure of Colette in Paris may still be sending ripples of grief through its legions of fans, but we dare say that Gina Tricot is doing a good job in staunching the psychic wounds. 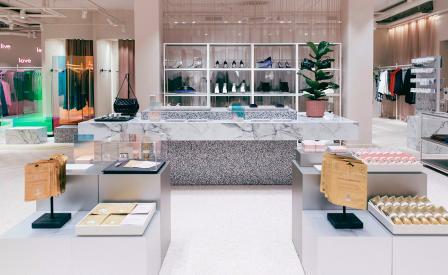 Long a staple with a young female demographic, the Swedish brand is attempting a makeover of its own by repositioning itself as a progressive fashion retailer. One of its first salvos is the conversion of a building in Stockholm’s retail Södermalm district – parts of which date back to the late 18th-century, and which was once the home of local Olympic hero Carl-Axel Pettersson – into a handsome, naturally lit two-storey store. Without detracting from the grand bones of the space, especially the high ceilings and oversized windows, Note Design Studio and Open Studio have inserted tinted screens, silvery reflective panels, and mirrors to create a open-plan retail environment in which spaces and merchandise (youthful dresses, silky silhouettes and quietly subtle accessories, among them) are demarcated by low display cabinets and sheer curtains. The spacious changing suites, in particular, are dressed with globular peach banquettes that create an instant mood of intimacy. An in-store café that serves smoothies and matcha lattes is a canny ploy to resolve retail dilemmas while extending time spent on the premises.